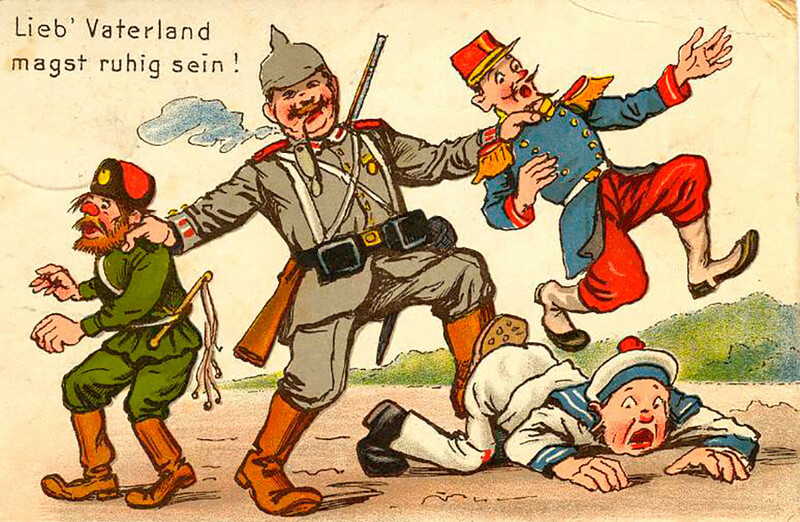 A Russian soldier yanks German and Austrian soldiers by the ears like naughty children. 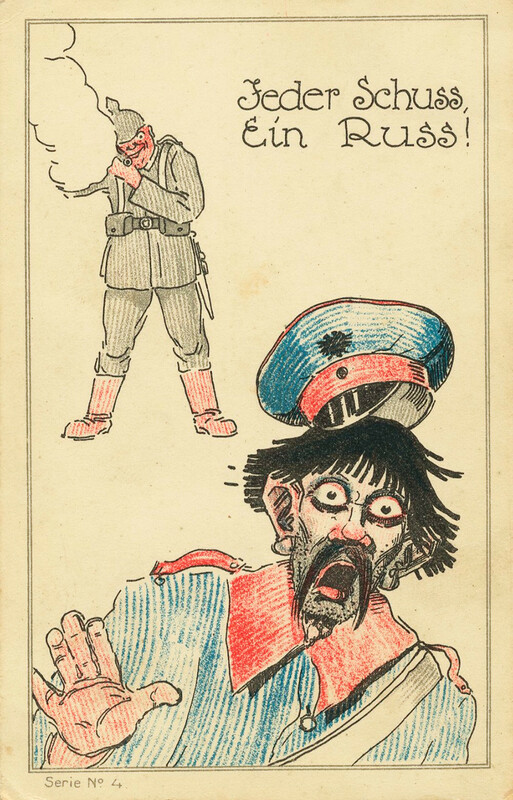 Russian soldiers always look like beggars, dressed in rags, with a drunken face. 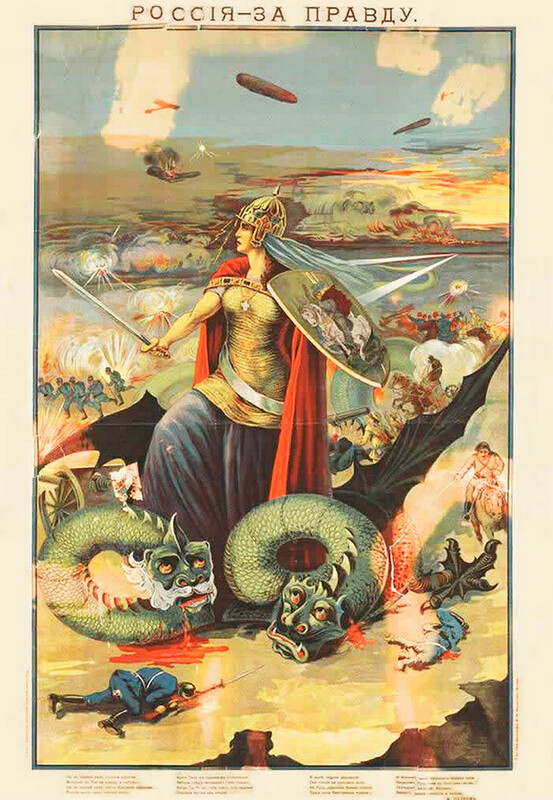 “I want to be Napoleon!” says German Emperor Wilhelm II. “Well, we will help” is the Russian answer. 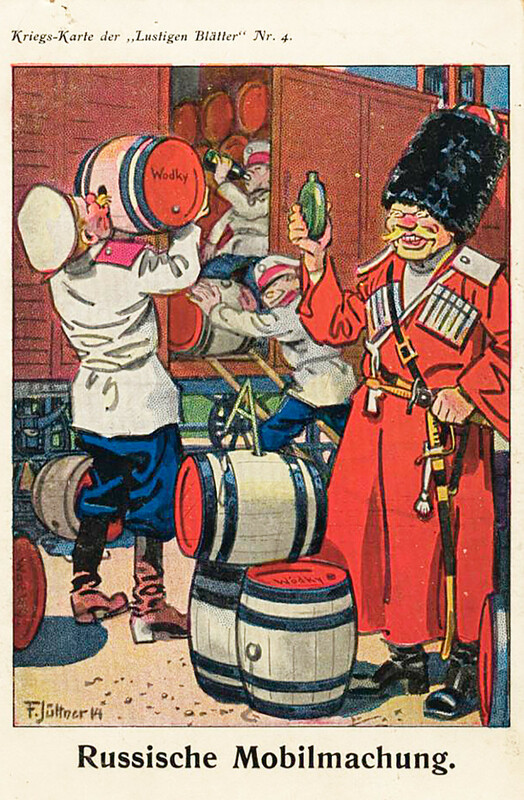 Mobilization à la russe: alcohol instead of soldiers. 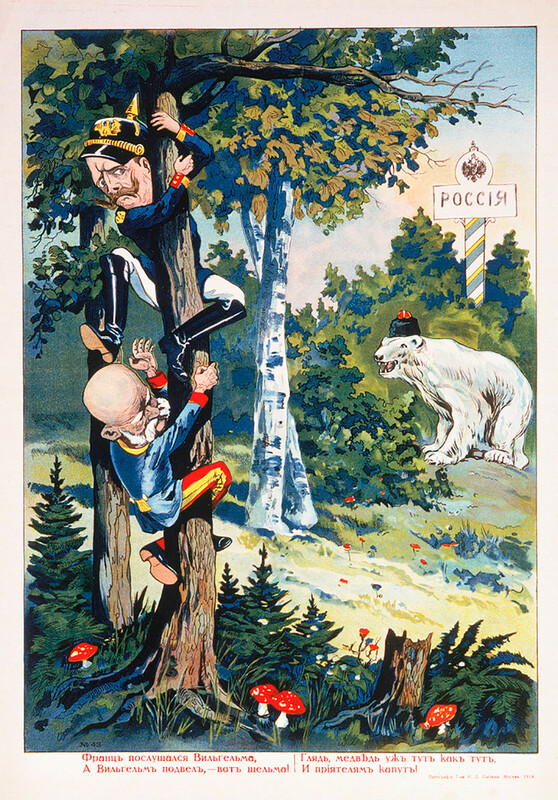 A Russian polar bear forces Wilhelm II and Franz Joseph I of Austria to seek refuge in a tree. 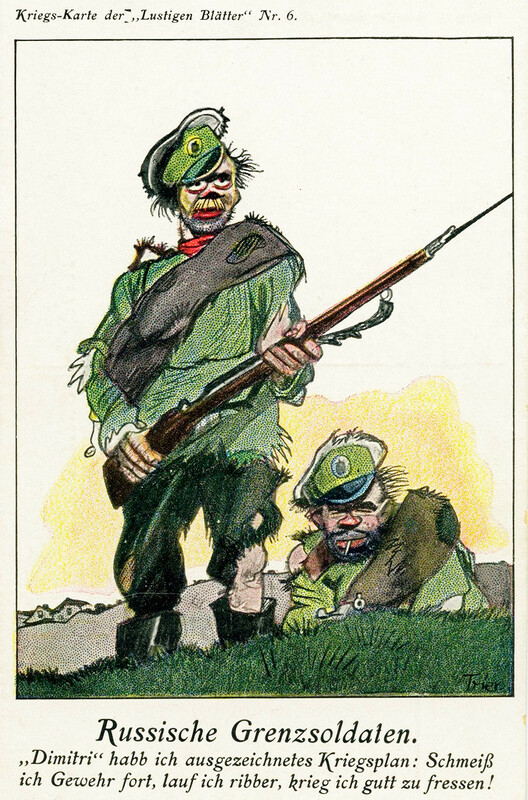 “Dear Fatherland, put your mind at rest” is the line from the German patriotic anthem, “Die Wacht am Rhein” (The Guard on the Rhine). 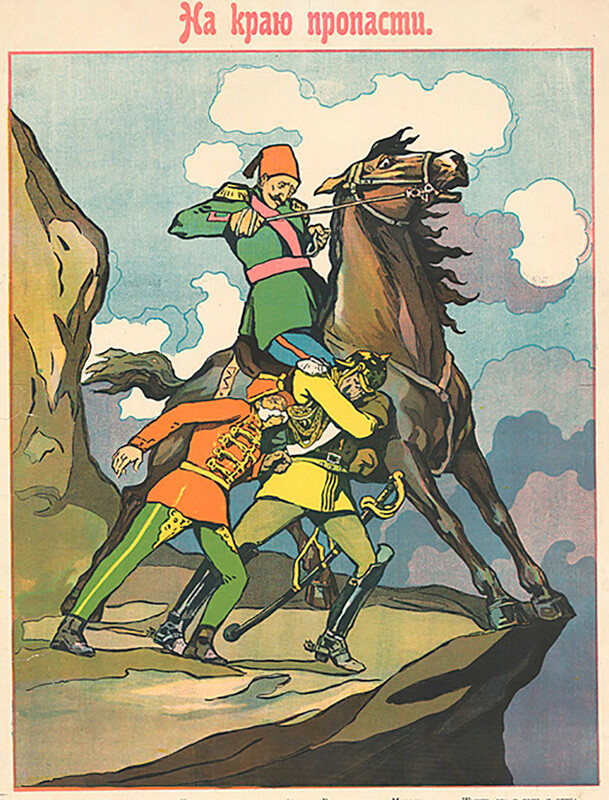 The German Emperor is terrified by a Don Cossack attack. 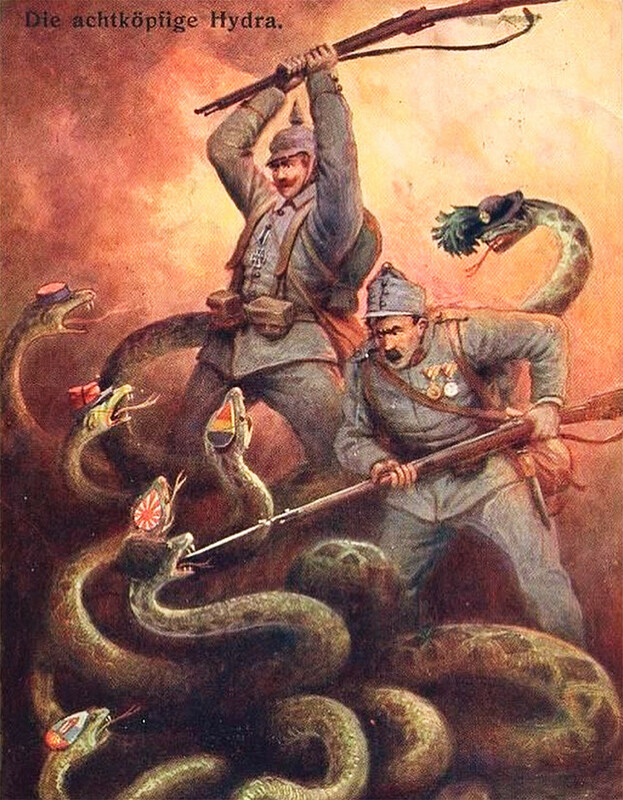 German and Austrian soldiers grapple with an eight-headed hydra. 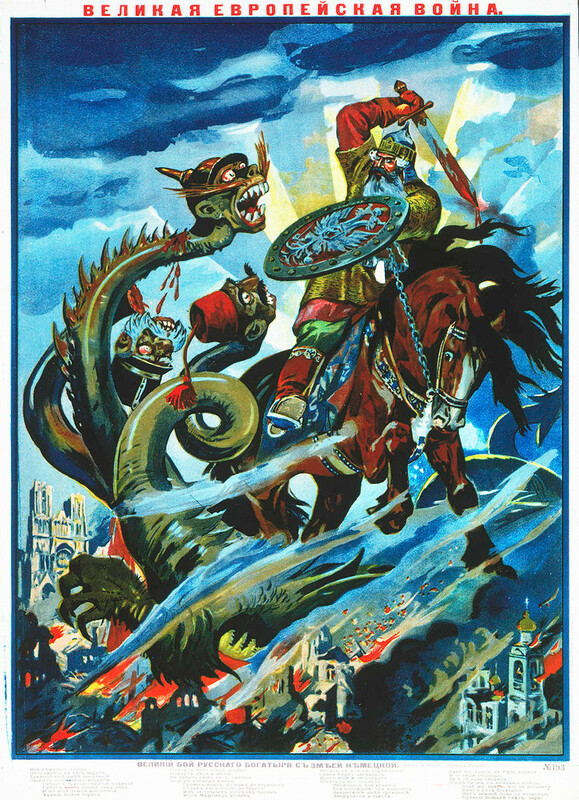 Bogatyr, legendary warrior of the Slavic folktales, beheads a three-headed dragon. 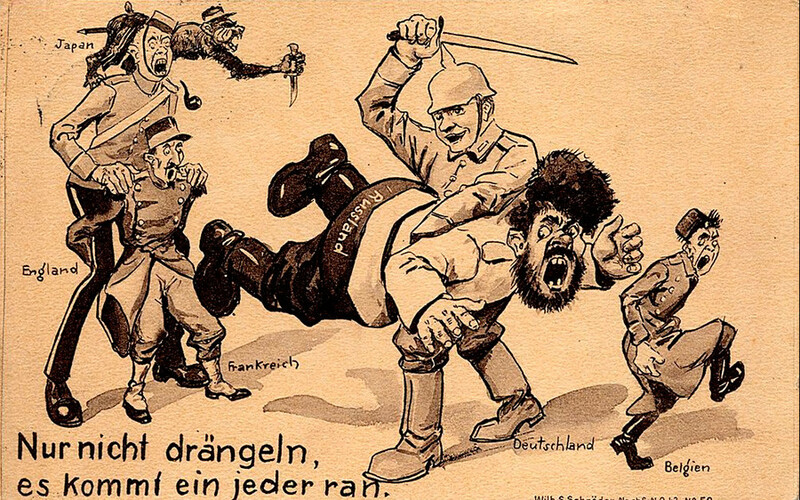 The Austrian head is done; the German and Ottoman ones will shortly follow. 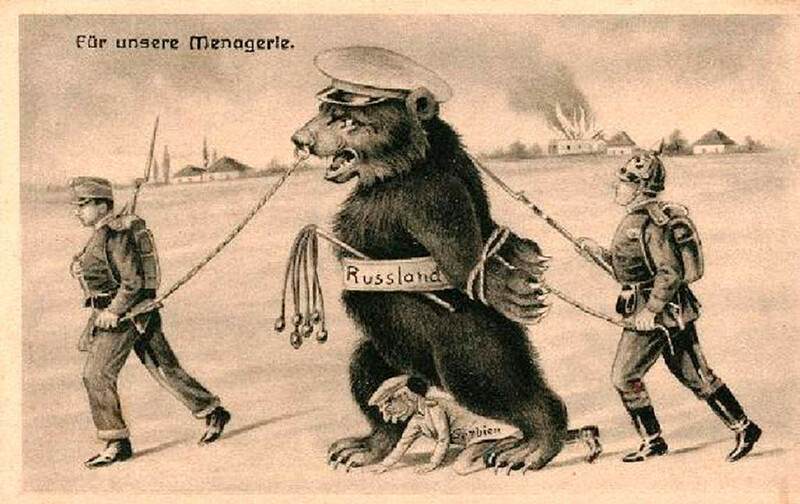 “For our menagerie”: A Russian bear is captured for the Central Powers’ animal collection. 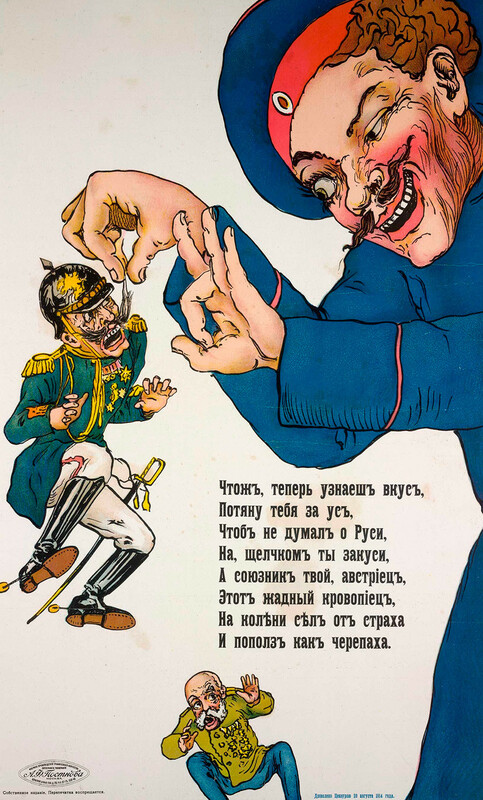 Crawling under the bear’s paws is Russia’s humiliated ally, Serbia. “Over the edge”. 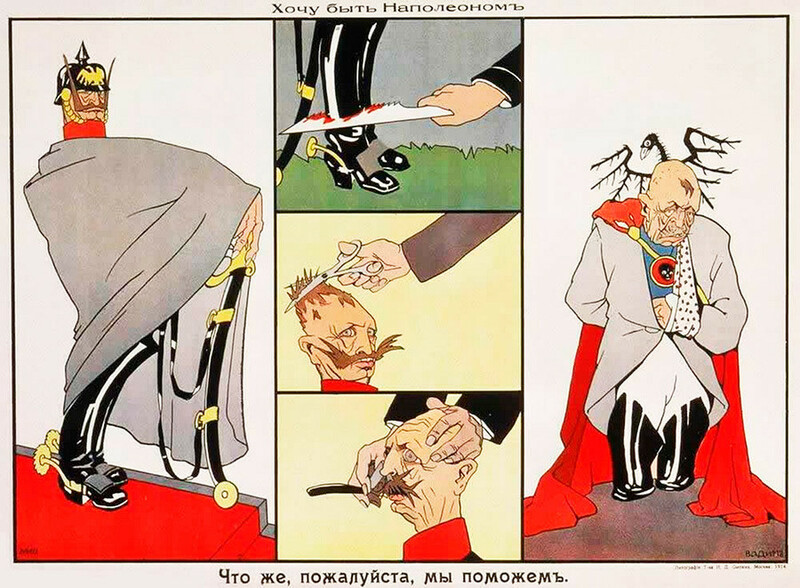 By dragging the Ottoman Empire into the war with Russia, Germany and Austria in fact push it into the abyss. Each will get what they deserve. 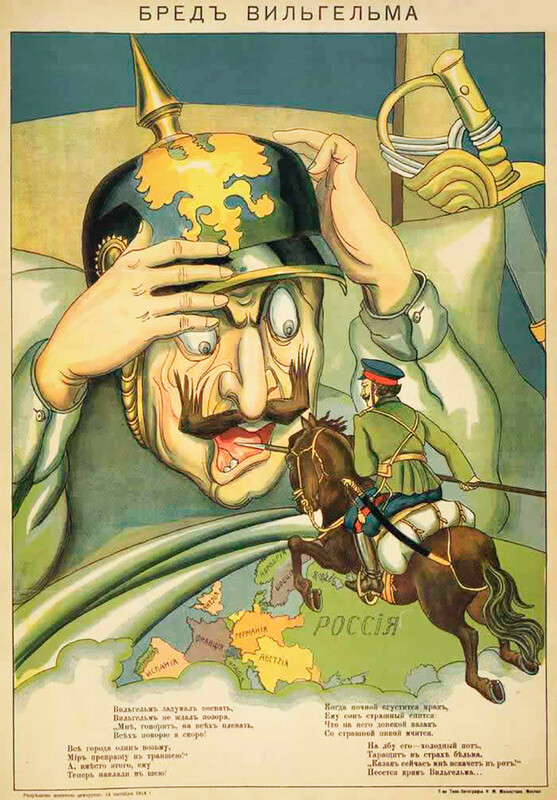 Belgium is already beaten, now its Russia’s turn. 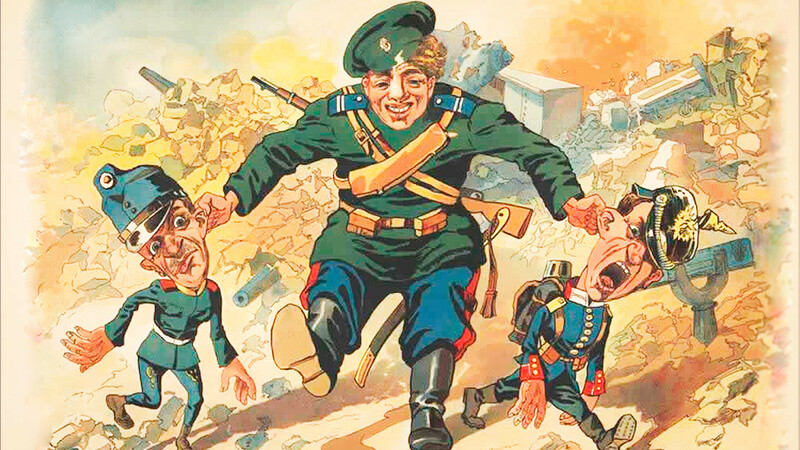 The German and Austrian leaders – these little dwarfs – will be flicked away like flies.